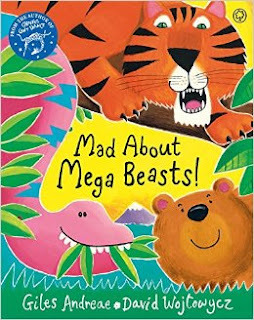 The counter-stroke to Mad about Minibeasts, Mad about Megabeasts is about all things large on land and sea. What will get children excited is that many of their favourites will be on here; tigers and blue whales. They will also get extras and perhaps even animals they haven't heard of before like giant manta rays or the mega dinosaur, argentinosaurus. Another great thing is the rhyming is better and more fluid than in Minibeasts, which will make reading more sing-song like. What I would have liked to see was more animals. Rhinos, Hippos would have been a great start, but if Emperor penguin was there, then why not Clydesdale or Condors? With all that said, it is a thoroughly enjoyable book and I would recommended it to all primary school aged children, as they can all learn something new. Mad About Minibeasts is one of many books from Giles and David. However Giles Andreae is probably a bit more famous having written the very popular Giraffe's Can't Dance. 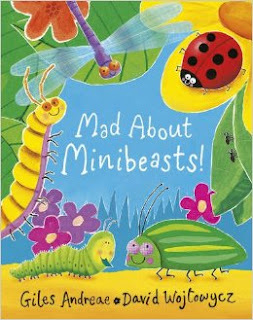 Essentially, Mad about Minibeasts is about what you might find in the garden. From slugs to insects to centipedes. It is a great way to introduce lots of animals (invertebrates) to youngsters. This book would be a great resource after a dig around the backyard or as an accompaniment to other books about creepy crawlies. Many of the rhymes will help detail facts about the minibeasts and some of them I did not even know! If your little boy or girl loves bugs, then this is definitely a book that can help get them even more excited.